NETWORK FINALS: Final numbers weren’t kind today, with 0.1 drops for MOM, POWERLESS, CHICAGO MED and THE BLACKLIST: REDEMPTION. 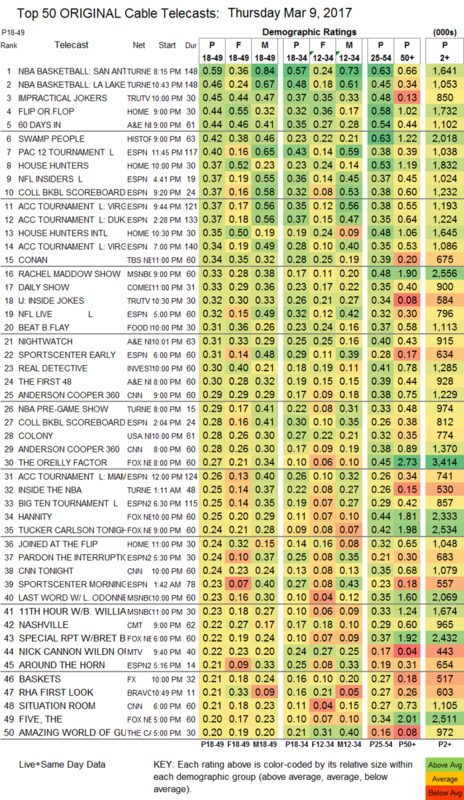 CABLE HIGHLIGHTS: Basketball took up half of the Top 14 slots on Thursday cable, with the NBA in the lead via TNT’s doubleheader, featuring San Antonio vs. Oklahoma City at 0.59 and Lakers vs. Phoenix at 0.46. ESPN had the COLLEGE BASKETBALL games, led by USC vs. UCLA at 0.40. 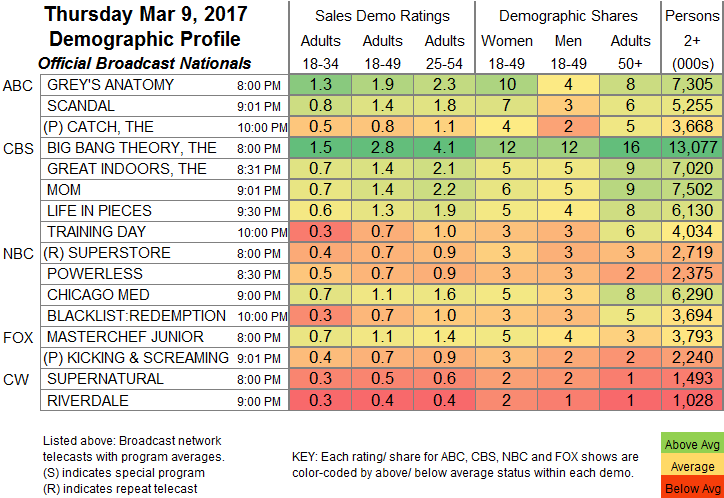 Tru’s IMPRACTICAL JOKERS was the highest-rated non-sports programming, steady at 0.45, and INSIDE JOKES was up 0.09 to 0.32. On HGTV, FLIP OR FLOP dropped 0.05 to 0.44, HOUSE HUNTERS fell 0.09 to 0.36, and HOUSE HUNTERS INTL was at 0.35. On A&E, 60 DAYS IN lost 0.04 to 0.44, NIGHTWATCH fell 0.08 to 0.31, and THE FIRST 48 ticked up to 0.30. History’s SWAMP PEOPLE plunged 0.17 to 0.42. MSNBC’s THE RACHEL MADDOW SHOW was again the highest-rated news show of the night at 0.33. Food Network’s BEAT BOBBY FLAY held at 0.31. USA’s COLONY edged up 0.02 to 0.30. The midseason finale of CMT’s NASHVILLE fell 0.05 to 0.22 (the Nick At Nite run was up 0.03 to 0.18), and SUN RECORDS ticked down to 0.14. MTV’s WILD N OUT was at 0.22/0.19, compared to last week’s 0.27/0.22. FX’s just-renewed BASKETS gained a tick to 0.21. On TLC, MY 600-LB LIFE lost 0.04 to 0.17, and SKIN TIGHT was down 0.05 to 0.17. We’s LA HAIR fell 0.04 to 0.10. POP’s IMPACT WRESTLING fell off the chart, although it was steady at 0.07/292K. The season finale of IFC’s PORTLANDIA was also off the chart, down 0.01 to 0.04/126K.